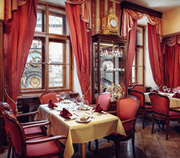 Traditional cafés in Prague are ornate, grand establishments. 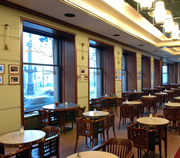 Take a take a break from sightseeing to enjoy a drink and a delicious cake in a delightful setting. 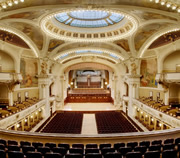 Municipal House in Prague is one of the finest Art Nouveau buildings in Europe. 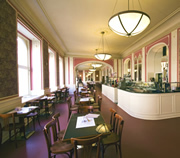 Inside is a magnificent complex of rooms, including the largest concert hall in Prague, fine restaurants, an American cocktail bar, an elegant traditional café and exhibition rooms.